Sail Area —————————- 625 Sq. Ft.
Power: Most were powered with the Westerbeke 40 or Westerbeke 50 engine. Above are color images of a Keel/Centerboard T37 in profile, and of the T37 accommodation plan. Thanks to Ray Durkee, #373 VELERA, who found these somewhere out there, floating around in the ether. 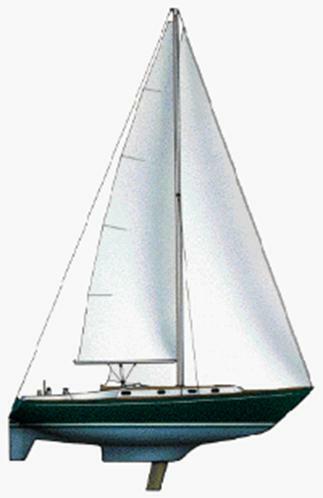 Thanks to Eric Freedman, former owner of Hull #252 KIMBERLITE, who sent along the specifications for the Westerbeke 50. 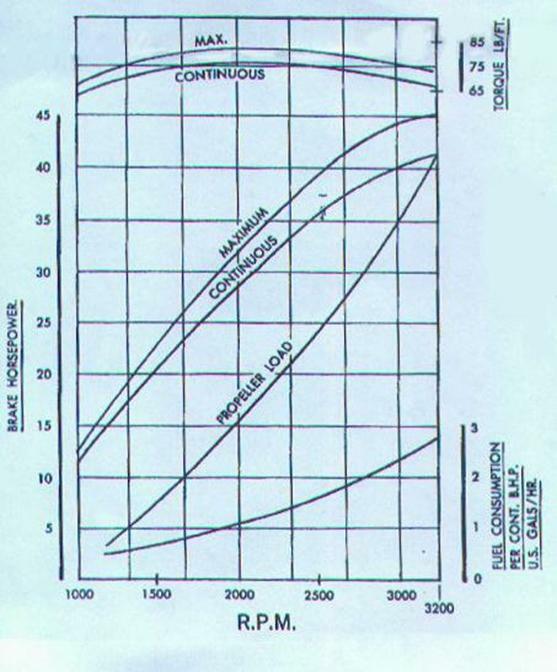 The power curves and the written specifications appear below. TYPE: Four cylinder four cycle overhead valve vertical in-line diesel. DISPLACEMENT: 110 cubic inches. Bore 3 5/32", stroke 3 1/2". WEIGHT: 460 lbs. basic engine. FUEL INJECTION EQUIPMENT: CAV distributor type injection pump and CAV Pintaux nozzles working in conjunction with Ricardo Comet V combustion chambers. CYLINDER BLOCK AND HEAD: Special cast iron mono blocks. CRANKSHAFT: Forged steel, counter balanced. PISTONS: Aluminum alloy with solid skirt. MAIN BEARINGS: Five, tri metal, heavy duty. LUBRICATION: Wet sump, eccentric rotor pressure pump, camshaft driven. EXHAUST MANIFOLD: Fresh water cooled. Front or rear opening. COOLING SYSTEM: Closed circuit system, including lube oil cooler with heat exchanger mounted. ANGLE OF INSTALLATION: 15 degrees maximum. ELECTRICAL SYSTEM: 12 Volt negative grounded system with 55 Amp alternator. MOUNTING: Flexible rubber mounts on 18" centers standard.